9. Mark gives more detail than Matthew and Luke concerning the incident on pages 112-114. How do Mark’s words quoting the father of the child help us in our own struggle with faith? 10. 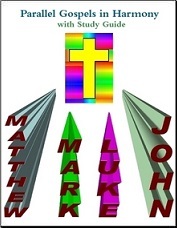 Only Matthew gives us what guidelines for dealing with transgressions in churches? (page 118) Would this still work today? 11. What parable about forgiveness is found only in Matthew on pages 119-120? Discuss how this applies to us and our salvation.